Sec. 17. (a) The state board shall provide information stressing the moral aspects of abstinence from sexual activity in any literature that it distributes to students and young adults concerning available methods for the prevention of acquired immune deficiency syndrome (AIDS). The literature must state that the best way to avoid AIDS is for young people to refrain from sexual activity until they are ready as adults to establish, in the context of marriage, a mutually faithful monogamous relationship. (b) The state board may not distribute AIDS literature described in subsection (a) to students without the consent of the governing body of the school corporation the students attend. 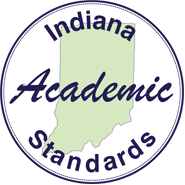 The Indiana Academic Standards for Health & Wellness 2017 specifically list the standards and indicators for grades PreK – 12. They are presented in grade bands; PreK-2, 3-5, 6-8, 9-12. The Resource Guide provides supporting materials to help educators successfully implement the Health & Wellness Standards. Use of these resources is optional.